REIGNITING MECHA—East Los Angeles College students gathered outside the English building yesterday and counted up to 43 to pay homage to the schoolars who went missing in Mexico four years ago. This group of students are hoping to bring back Movimiento Estudiantil Chicano de Aztlan to ELAC. Enrollment among undocumented students continues to decline, according to Los Angeles Community College District Chancellor Francisco C. Rodriguez. “Numbers continue to draw down, from fall of 2016 to fall of 2018, we lost 21% of credit undocumented students,” said Chancellor Rodriguez at the Ad Hoc Deferred Action for Childhood Arrivals Task Force meeting at ELAC Thursday. He met with ELAC’s Dream Resource Center, as well as staff from the other eight colleges within the LACCD. The purpose of the meeting was to hear directly from students, faculty and staff about what resources are needed and how they should be allocated. The ELAC Dream Resource Center also announced their Undocumented Student Week of Action, which will take place Oct. 15 – 18 at ELAC. 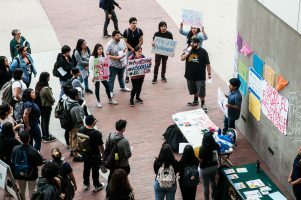 The week of action aims to support DACA recipients, undocumented students and AB540 students and will offer a lot of resources for students including a Dream Act Application clinic, film screenings and workshops. During the Student Voices segment, one undocumented ELAC student talked about the ignorance surrounding undocumented people. Even in places like college, the student said, the faculty didn’t know about existing laws aimed at help undocumented students, like Senate Bill No. 68. “My situation is a really unique situation, because I can’t apply for DACA… for people like me who can’t afford college due to their financial situation or their legal situation,” the student said. Melody Klingenfuss, statewide organizer for the Coalition for Humane Immigrant Rights, talked about how the Trump administration is reshaping existing laws and twisting them to make it harder for immigrants to seek permanent status. Klingenfuss highlighted two that are in the process of becoming law, but are not official yet. The first is called “Public Charge.” Public charge refers to individuals who receive aid from the federal government. “It basically says a person who is trying to seek help from the federal government is a burden to society,” Klingenfuss said. The second law, the “Flores Settlement” from the 1990s says children cannot be detained longer than 20 days. The Trump administration is trying to change the Flores Settlement from 20 days to indefinitely, she said. Klingenfuss said to be cautious of people offering to help with new DACA applications because the government is only accepting DACA renewals, not new applications. The Dream Resource center is located at E1-142 and is open Monday through Thursday from 8 a.m. to 5 p.m., and Friday from 8 a.m. to 2 p.m.